In an editorial 08-22-17 entitled "WHAT WE KEEP FORGETTING ABOUT MARKET EUPHORIA & GREED" I outlined that in the Short Term the market reacts to Sentiment. I showed that research by Dr Ed Yardeni indicated how closely) the Consumer Comfort Index in fact tracks the Forward S&P 500 PE. 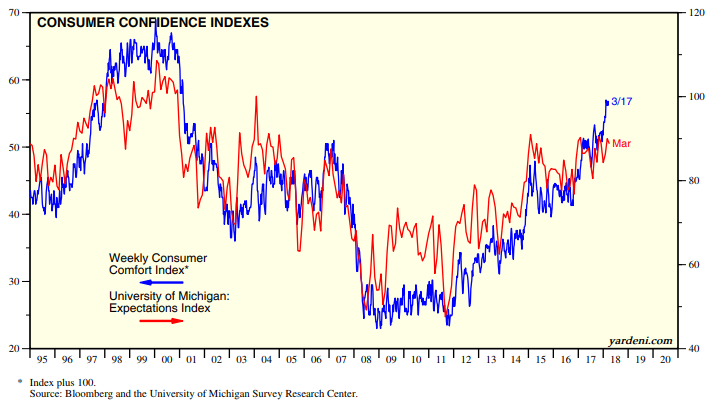 The Consumer Comfort Index slightly leads which allows you to get a "Heads-Up" on a potential shift! 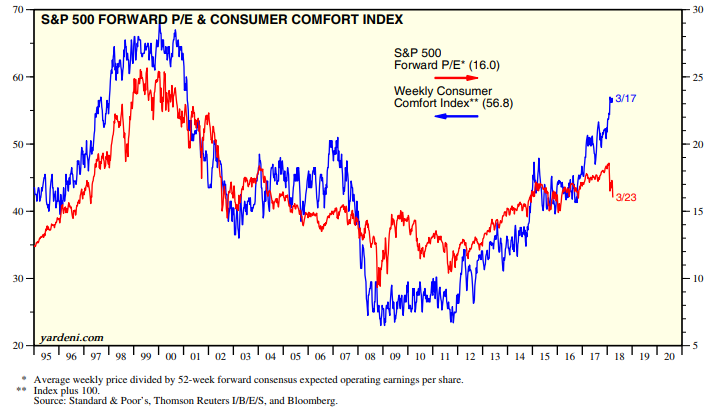 I followed up with an article entitled "SENTIMENT: CONSUMER COMFORT CORRELATES WITH FORWARD S&P 500 PE" on 09-07-17. U.S. consumer sentiment advanced last week to a fresh 17-year high as greater optimism about household finances and the buying climate more than offset a deterioration in views about the economy, the Bloomberg Consumer Comfort Index showed Thursday.